Yes, I am finally bringing back the True History! I know I promised this a long time ago, but unfortunately health and life issues got in the way, so I was unable to complete it. This time however I’m bringing it back at full force. This will be a complete analysis that will encapsulate every single big mystery in the world of One Piece and piece them together in such a way that it all makes sense. Once you truly read through it all it really clicks, you finally understand the bigger picture. I’m teasing some of it in this chapter with the information at the end, but to know all the details you’ll have to wait just two more months where you’ll finally understand the major secrets in the series! Anyways, as June begins the summer season also begins. Despite that, I’ll definitely be working hard over this summer to deliver you a lot of content. Let’s begin that with the analysis of this incredible chapter! Next Update: Patreon Rewards added! ¡Qué rápido has escrito tanta información! A mí lo que se me ha venido a la mente al ver el sombrero es el huevo gigante que Roger llevaba en el Oro Jackson, ¿estarán relacionados? 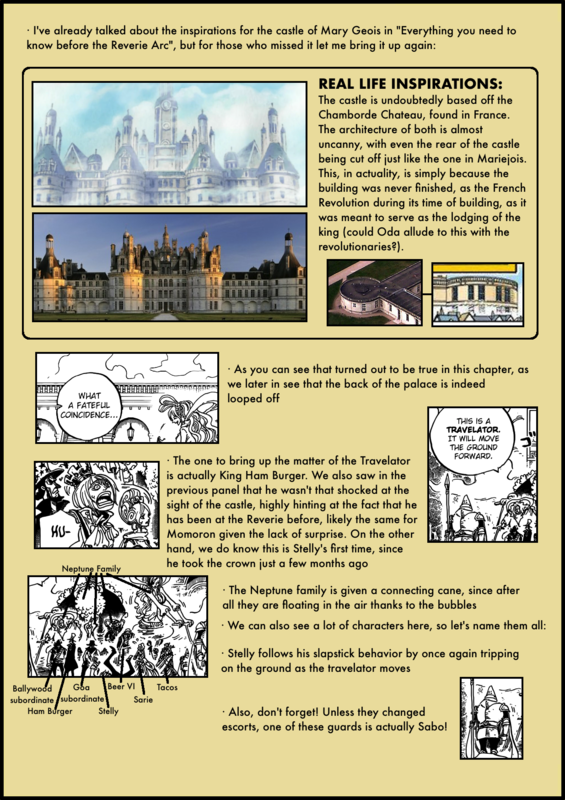 About the parts where you say that Gol D Roger decided or couldn’t activate the One Piece, I want to add that when Nico Robin asked Rayleigh on chapter 507 panel 6 about the history and he says that they (Gol D Roger crew) reached some sort of conclusion which was probably to not activate the One Piece and suggested to her to keep traveling and step by step learning about the world to make the right decision once the time arrives. I’m intrinsically amused that you haven’t counted the statues. From the panel that we can see the staircase, the right side have 5 statues, sum that with the left wall and we have a total of 10. There are two staircase with statues, so… there are 20 statues. This number reminds me of something… you know what? There were 20 families that came to form the celestial dragons. You are exactly right! Someone else pointed it out, that might really be the case! Hey, Arthur! Me again! 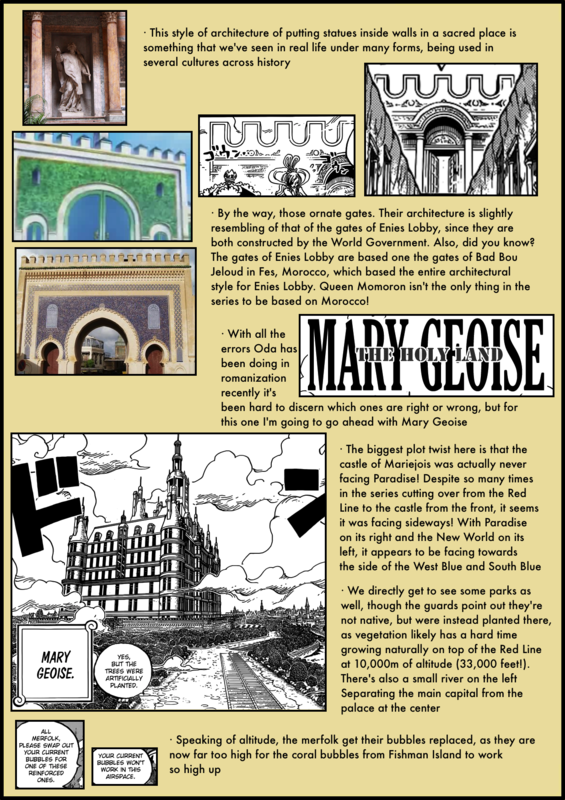 I found out something very interesting, check out the page where Sai is. Oda made sure to put a “Don” on his re-introduction but before his name to make look like “Don” Sai, like Don Chinjao. This interpretation is reinforced because he puts the exclamation of the onomatopeia after Sai’s name. It could be as a way to recognize him unofficially because he still has a long way to go to carry the “Don”. For the longest moment I didn’t get exactly what you meant… but then I saw it. Holy crap that’s so cool!!! Dude, you do such a good job on these. I don’t know how you put out such incredible content every week so quickly, but seriously thank you. You not only articulate a solid break down of the chapter, but reference panels from hundreds of chapters ago and real life events/buildings/people/etc. instantly. You connect things super quickly. You don’t just randomly guess and things and state them as fact. Your speculation is a short part of most breakdowns and you label it very clearly as speculation. It’s often very plausible speculation as well. I know this is a lot of hard work and just wanted to take the time to say that it’s appreciated. I make it a part of my Friday routine to read the chapter and then read your break down. Have a great weekend. See you for 907. Thanks, Artur! You are my hero! I think that the giant Straw Hat was made for a giant by someone from the Ancient Kingdom. I think that it only represents the “Will of D.”. I don’t see it as something with a material usefulness, but as something with an inmaterial significance. I’d suggest using a different name for it though, try to find a name that fits it more as your own thing! hmmm okay you mean like instead of Chapter Secrets something else huhh…okay…thanks. Hey BTW i want to talk to you about something, will you reply to the mails?? Sure, if you want to hit me up just mail me. I already did mail you Artur, I am expecting a reply for a while now…I can understand you must be busy..
Hey Artur! I am from China. Thanks for your hard work. We all love the One Piece! Very good, as always. 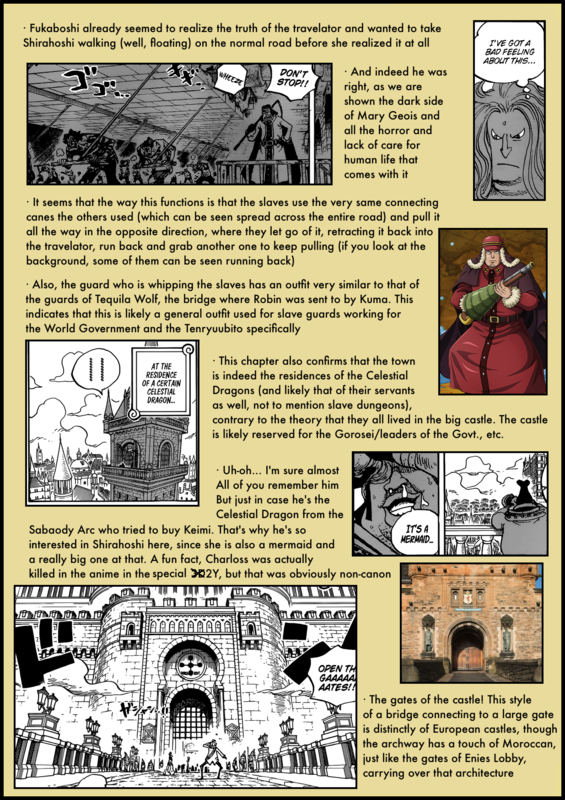 Your analysis makes reading One Piece even greater than it already is. Two things I’d like to point. 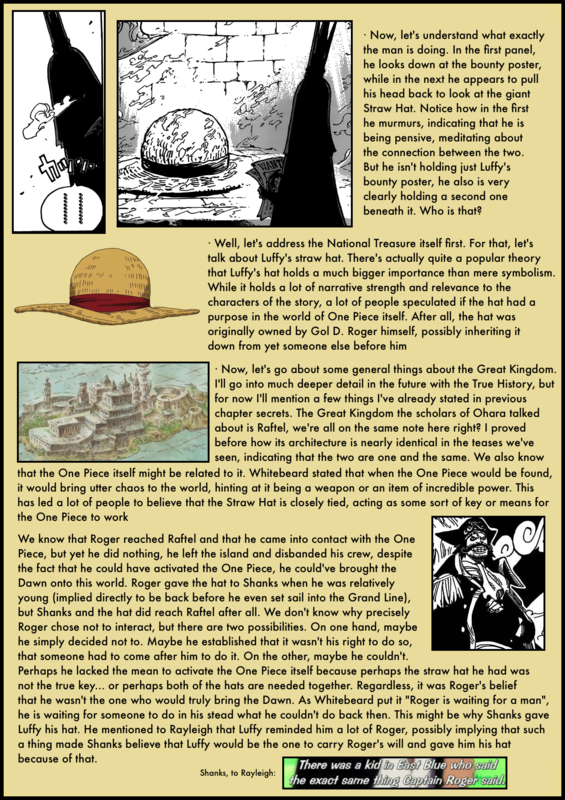 1) You let that implicit, I guess, but, probably the events from last page happened becouse of the recent news, which put Luffy in the spotlight and made the person concern about his hat being “the one hat”, whatever that means. I know Luffy hqd played big roles in the world news. But, if the person is a Celestion Dragon or other important person, it would make sense that he didn’t gave the right atention to other news. 2) I think you are mistaken about the “up there” from Doflamingo. As he is in Impel Down level 6, it probably refers that the assassins (I agree with them being CP0) are infiltrating Impel Down at the moment, being at some level above. 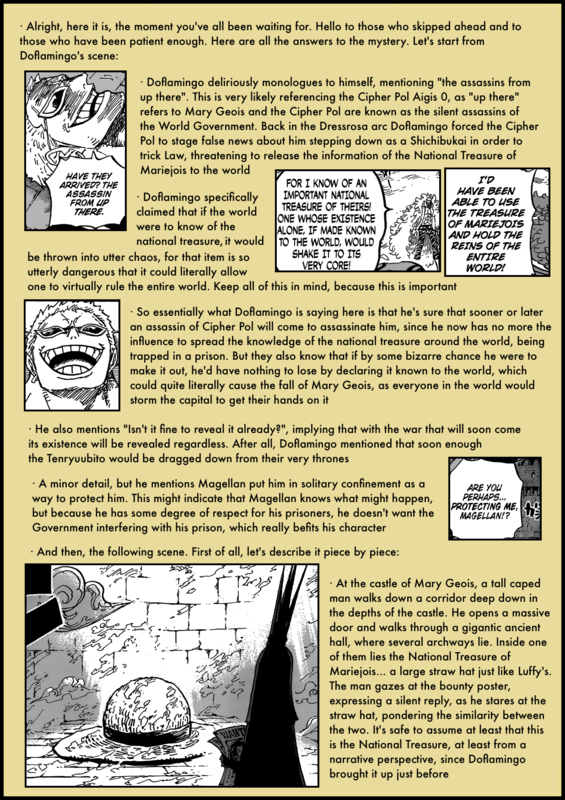 In this way, it would make more sense for Magellan to be at Dofla’s cell, as the danger is imminent. This has a very significant imply. Doflamingo will be killed or will escape. Personally, I think he will escape, otherwise it would have been killed already (maybe in transport). There must be a purpose for Oda to let him alive for so much time (a purpose for the story, not in the story). Don’t take this as critics, for it’s not. I never had the will to coment in any site or blog about anything. I’ve always been just a reader. But your good work and the quality of the coments in it makes me willing to participate. Hope you keep yor great work. I’m excited for your true story text. For the first point, yes, I implicitly meant it. On the second point, I’ll hold on until I get the raws just to check, but I believe Doflamingo refers to the assassin “that come from up there”, not “that are up there”, but I’ll wait unntil the raws come out. The way it’s translated also seems to be an expression rather than an indication of their location. Hopefully you will do it in text format, here in WordPress itself, instead of images, because that way, those of us who don’t speak English as well, if we don’t understand something we could use the translator to understand it perfectly. This is the best One Piece page to date, thank you very much for all your efforts. In case you haven’t understood me correctly, I mean that instead of making images.jpg, we would much prefer it to be layout on the web itself. I have some points I don’t agree with you. 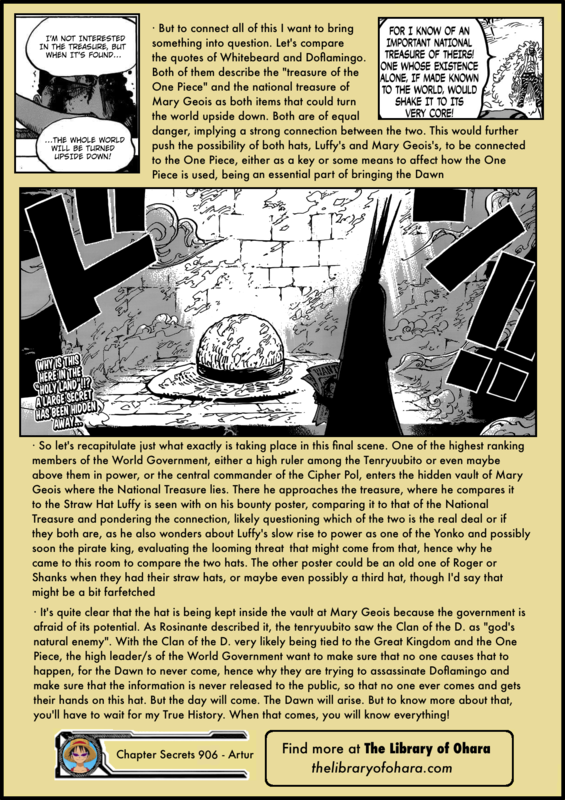 I don’t think that the straw hat is THE national treasure but A national treasure. Looking at the arc way there are probably more such rooms. 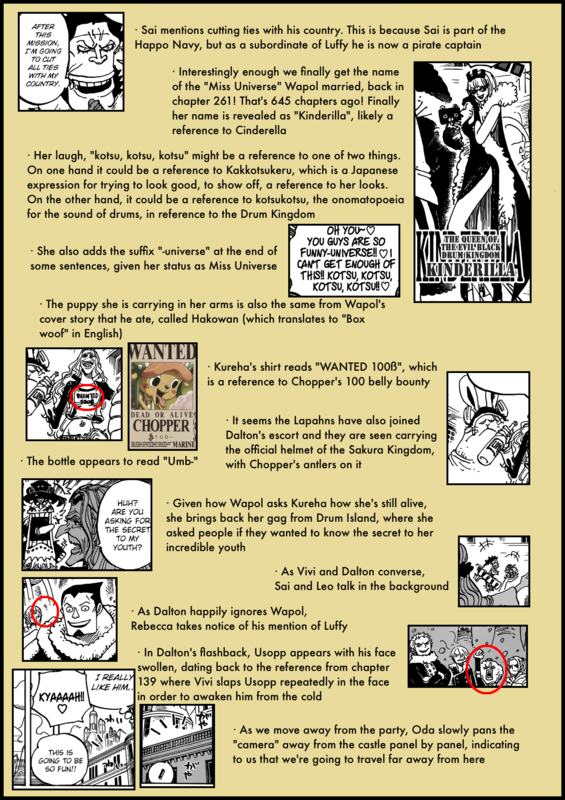 It can be the thing DonFlamingo points to but it could be another (keep in mind: Oda loves to give red herring away..!). I don’t doubt that this will play an important role in the story from now on (or had played but we didn’t know it). Dude, i’m amazed by your content, it’s just sensational, congrats on the work! while V doesnt exist so VIVI written BI-BI in katakana. Yo, I really like this analysis. However, I noticed that none of the commentators or you mentioned what the hat was sitting on. Others have pointed out the crack in the stone slab, indicating that it might be a coffin or tomb. Hope this helps! Thanks! I’ve heard of this theory, but crack? All I see is frost, where do you see the crack? Your analysis secrets looks like very helpful. about that big strawhat. is it possible that strawhat is not the real treasure? I’m thinking that the real treasure is stolen. taken by the owner of that strawhat, who is a “D” from the Great Kingdom. he leave that strawhat as a symbol or as a thief’s signature. he hid that treasure in the secret Island of Raftel. perhaps this is one of the reason Im (or his ancestor) to command 20 Kingdoms to destroy the Great Kingdom. 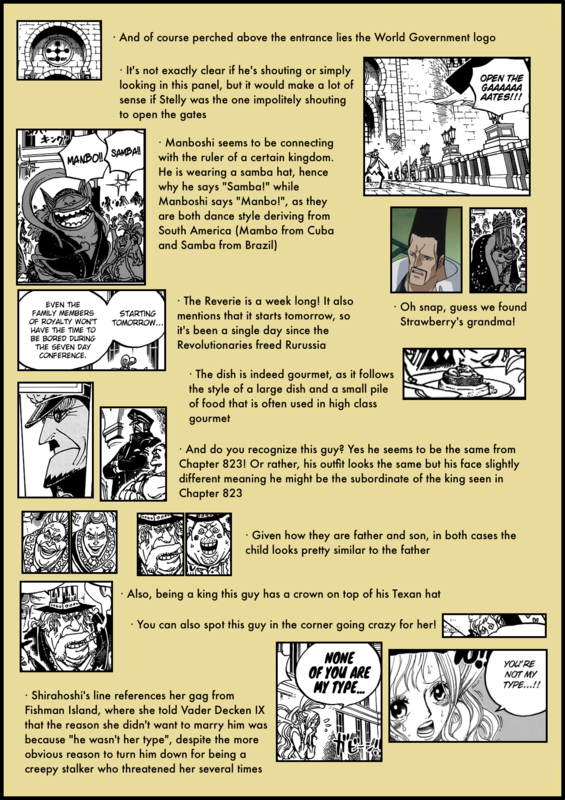 as why Im still kept the big strawhat in the vault, because the whole stolen treasure thing is top-secret. that treasure is the source of Im’s mythical power, if it’s not in his possession, he will getting weak. or if that treasure be in the form of a Weapon, he won’t be as strong as before. so, it’s definitely bad if the whole world knew about this. but.. Doflamingo somehow knew about this stolen treasure thing. which then he use this to blackmail WG (or Im in particular). 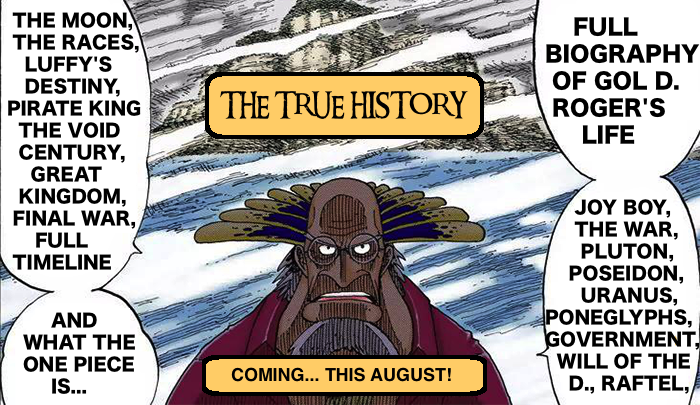 in some translation of ch 906, Doflamingo said this, “Isn’t it fine to reveal what it is already..?” which means people the world is already aware of the existence of this treasure, but perhaps in different name, “One Piece”. well, this is just my crazy theory. which based only from my understanding not compiling from various facts. so, there must be something I have missed. 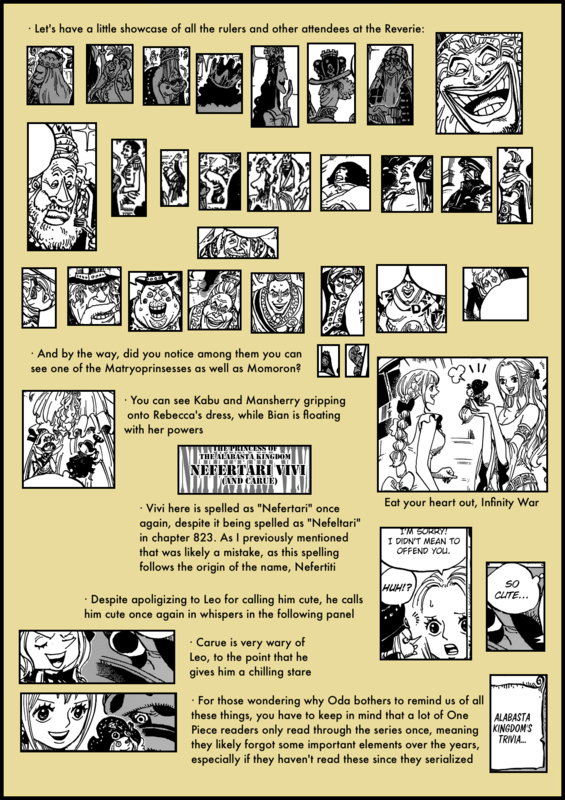 Did you noticed the weird sign position on bounty list behind the Luffys one in last page of 906 chapter? Its drown like S S, not S and inverted S how all other bounties drown. Maybe its old pattern of bounty (back to Void Century) or its just low-res visual glitch? Thank you for your work, keep it going! 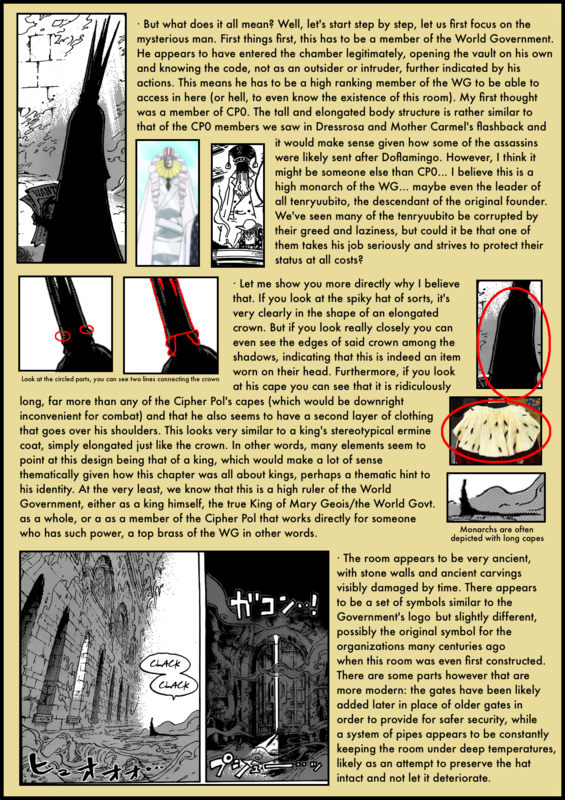 I’d quite frankly peg it as a mistake by Oda, since this really seems like something rather obvious to be a mistake. 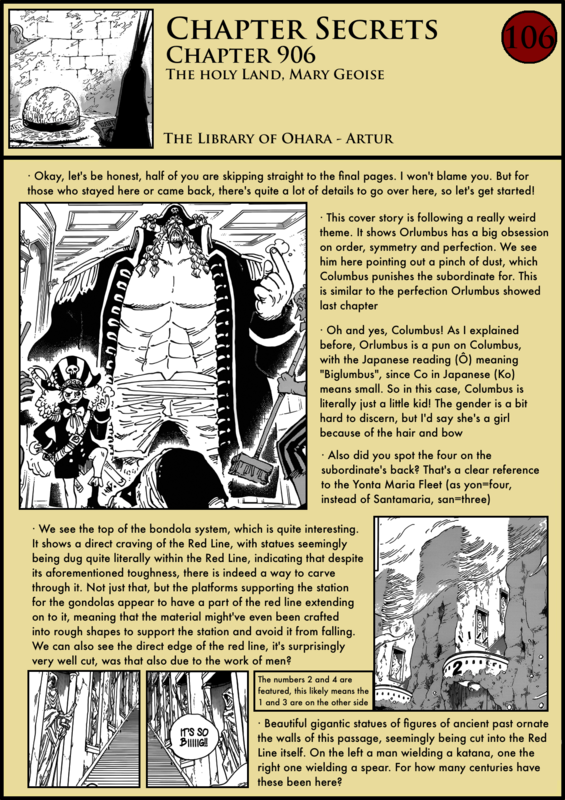 I highly doubt this could be an indication of it being old or something, especially with last chapter essentially implying that the poster was Blackbeard’s. I wouldn’t be that sure that is BB poster, because its doesn’t connect to each other (BB and Luffy, i mean there are another D guys in the world, so why Im-sama brought their bounty prices together, except there are “Yonko”), so maybe its someone who held this hat a long time ago and Im-sama kinda have flashback or saw some connections between them. Oda drew a hundred of this bounty poster so i don’t think that was mistake. But will see, its getting super entertaining! I’m Waiting for the next chapters and your reviews on them! 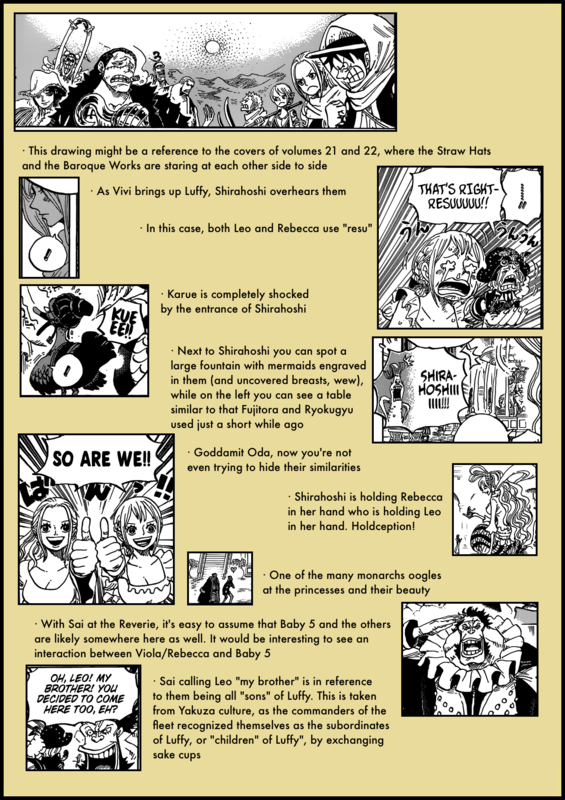 Luffy and Blackbeard seem to be the two biggest characters in the world of OP, at least story wise. They are both D. and they both have a chance of becoming pirate king (with Morgans saying it would be someone from the Worst Generation, which includes BB). And of course, they are the main protagonist and the main antagonist. That might not justify it entirely from an in-world perspective, but I feel Im is up to something here.